The U.S. Department of Transportation (DOT) is releasing a second Jason’s Law survey to seek additional public input on the state of truck parking in the country. Jason’s Law is named for truck driver Jason Rivenburg, who was killed during a robbery attempt in 2009 at an abandoned gas station in South Carolina while stopping for rest. In 2012 the law was included as part of the Transportation Reauthorization Bill that provides millions of dollars in federal funding to provide safer roadside parking. The initial survey was conducted in 2015 and is being updated as required under MAP-21 §1401(c), which calls for regular evaluations. The survey intends to evaluate the capability of the states to provide adequate parking and rest facilities for commercial motor vehicles engaged in interstate transportation. No personally identifying information will be collected. 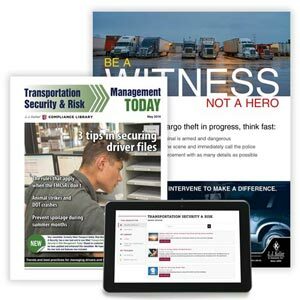 J. J. Keller's Transport Safety Risk Management & Security Newsletter keeps you up-to-date on the latest security and motor carrier safety risk management.